As I have stated in the past, Hip Hop and Rap are not my area of expertise, however the music of Biggie is set against the backdrop of one the most incredible true story feuds, that it rivals only that of Hatfield and McCoy’s. 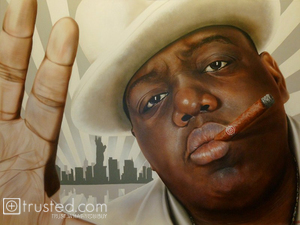 Biggie’s “loose easy flow” thrust him into being the central figure on the East Coast rap scene when the genre was dominated by West Coast Hip Hop. While recording his second album, Biggie found himself heavily involved in the growing East vs. West hip hop feud. It was this feud that allegedly lead to the demise of not one, but two of the generations most influential upcoming stars.